Committed utilitarian reading is either dominantly practical or more or less equally practical and fulfilling. Pleasurable reading is conceptualized as an important kind of casual leisure, experienced primarily as relaxation, active entertainment, and sexual stimulation (racy, pornographic stories). Such reading can also be a launching pad for day-dreams or lively conversation. Self-fulfilling reading is explored in a disquisition on the liberal arts hobbies. This is no place for speed reading, but instead is where we care to pause often to appreciate the artistry of the writing, creativity of the plot, profundity of the message (i.e., the information it contains), and the like. And in fulfilling reading we sometimes want to analyze the material. This book explores three main motives for reading identified as utilitarian, pleasurable, and fulfilling. Its principal object is to deepen our understanding of why some adults (and eager late adolescent readers) go in for “committed reading,” or reading that, as we strive to acquire literary knowledge and experience, necessarily consumes considerable time and requires continuous concentration. The conceptual frameworks guiding this endeavor are library and information science and the serious leisure perspective. Through their lenses the author examines the reading of books, magazines, manuals, reports, and other lengthy material as carried out in the three domains of life: work, leisure, and non-work obligation. In brief, committed reading provides its enthusiasts with knowledge and experience, which among other ways, are sought, acquired, interpreted, organized, and sometimes disseminated within the three domains. Robert A. Stebbins, FRSC, is Faculty Professor in the Department of Sociology at the University of Calgary. He has written over 225 articles and chapters and written or edited 41 books, including recent titles The Idea of Leisure: First Principles; Serious Leisure: A Perspective for Our Time; Personal Decisions in the Public Square: Beyond Problem Solving into a Positive Sociology; Leisure and Consumption: Common Ground/Separate Worlds; and Social Entrepreneurship for Dummies. Stebbins was elected Fellow of the Academy of Leisure Sciences in 1996, the Royal Society of Canada in 1999, and the World Leisure Academy in 2010. This book is of interest to those wanting a philosophical approach to the act of reading, but there is little practical information for the layperson, librarian, or information professional seeking inspiration and ideas for encouraging reading by others. 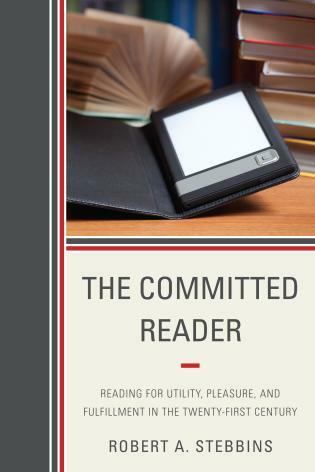 The Committed Reader adopts a positive sociological approach to reading and proposes a complex typology of reading as an activity that can be utilitarian, pleasurable or fulfilling. Readers familiar with Robert Stebbins’s work will not be surprised to find the book is theoretically grounded in the serious leisure perspective and seeks to develop a framework within which committed reading canm be explained through constructs of serious leisure. . . . The author’s positive sociological approach is reflected in its intended contribution to library and information science as a way of quantifying ‘information’s place in leisure’, that is, reading undertaken in pursuit of life-enhancing leisure activity. ... To members of the leisure studies community, The Committed Reader offers a positive sociological framework for investigations of reading for leisure. This framework is complex, broad and amorphous. For librarians it helps with understanding information behaviour. Stebbins has produced a scholarly work which is well defined. This book also examines committed reading in daily life, its ease, convenience, affordability, and enduring effects. There follows a portrait of the various reading environments, including music to read by, reading at airports and on airplanes, reading in one’s study, in a park, on public transit, in public libraries, and elsewhere. This is part of the reader’s social world, which is further comprised of book clubs, bookstores, Amazon.com, censorship, author public readings, and more.